I think this cream is very nice. 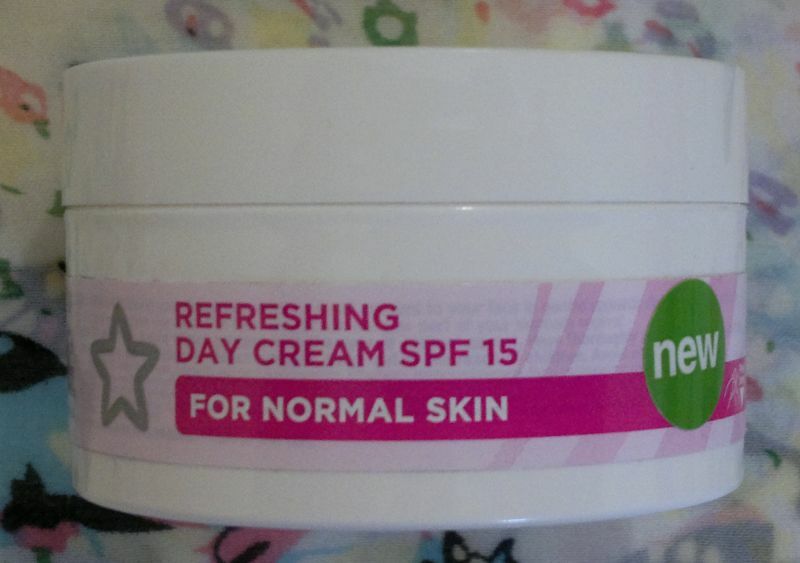 It has SPF 15, and it’s great for dry skin too – and it’s only £3.49. This is the ultimate no-nonsense moisturiser. I really like this palette. 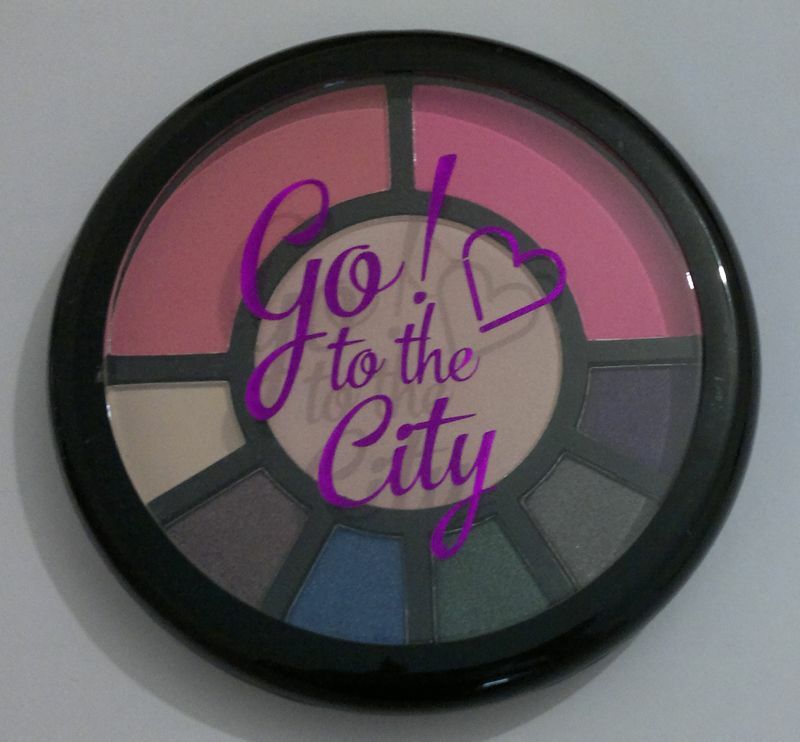 It contains a highlighter, two blushes and six eyeshadows. I’m happy with the quality and I know I’ll be using this palette a lot. I think NYC did a fantastic job with this lip stain. The product is a bit drying when I use it for a few days in a row. But I love the colour, the formula, and the finished look which is essentially a ‘my lips but better’ look. What’s not to love? I’d like to throw in a few honourable mentions as well. I really love Superdrug’s Naturally Radiant Micro Polish and Yves Rocher’s Apple and Star Anise products. I think Boots’ Vitamin Recovery Mask is brilliant, and I’m enjoying my I Love… shower products. Have you tried any of these products? Or have you discovered any new beauty favourites recently? Please feel free to let me know what you think. And thanks for stopping by! Hi there! Not too long ago I told you I went nuts at Yves Rocher’s clearance sale. And I’ve already reviewed Yves Rocher’s Apple Star Anise Shower Gel. 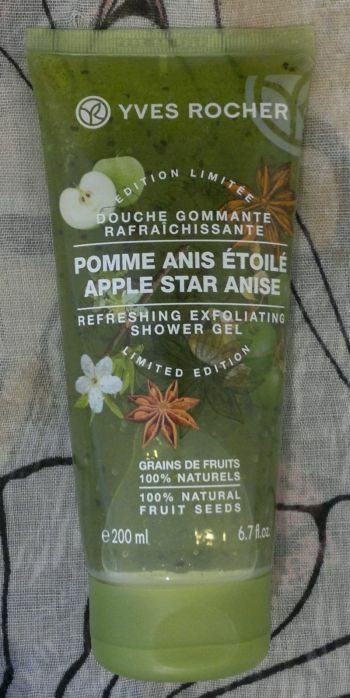 And now that I’ve finally tried Yves Rocher’s Apple Star Anise Refreshing Exfoliating Shower Gel, I’ll tell you what this product’s like. This exfoliating shower gel claims to be gentle enough for daily use. And it containts kiwi seeds and apricot kernel powder – these two ingredients are meant to give your skin a good scrub! So how’s the product? It’s really good. It exfoliates my skin, but it’s also gentle. I don’t use it every day, but I think I could. The fresh and sunny apple scent is very authentic. Other manufacturers of toiletries should take note because this is the apple fragrance they should aim for! All in all, this is a very nice exfoliating shower gel. It feels good, it smells good, it’s refreshing… I should have bought two bottles! 🙂 The exfoliating shower gel is/was (?) 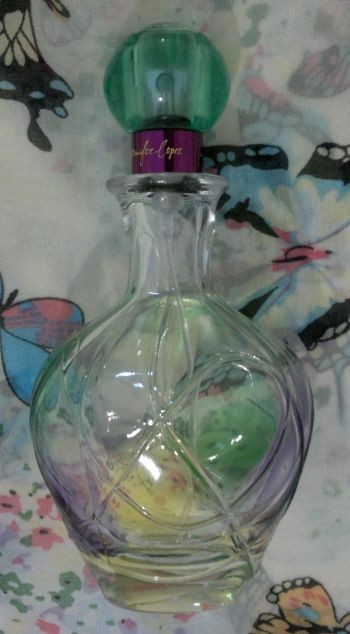 available as 200ml (£4.50). I found it in the clearance sale for just under £2. I think Yves Rocher should consider making it a permanent edition! Hi there! Thanks to a recent promotion (triple points on Superdrug own-brand products AND 3 for 2 on face masks) I bought anther 15 or so face masks. I’m not a fan of coconuts, but I bought this Superdrug Tropical Cocktail Peel-Off Mask anyway. And I’ve already tried it. This mask works like any other peel-off mask. You apply it, you let it dry for 15 to 20 minutes, and once it’s dry, you just peel it off. What I like about this mask is that it isn’t as runny as Superdrug’s Fruit Sorbet Antioxidant Peel-Off Mask. This mask is rather gooey which is great because it’s easier to apply. Another thing I like is that the pineapple and coconut fragrance isn’t very strong. I can smell a random tropical scent when I apply the mask, but it doesn’t last long. So all in all, I think this is a really nice peel-off face mask. I’d recommend it and I’m sure I’ll buy it again. 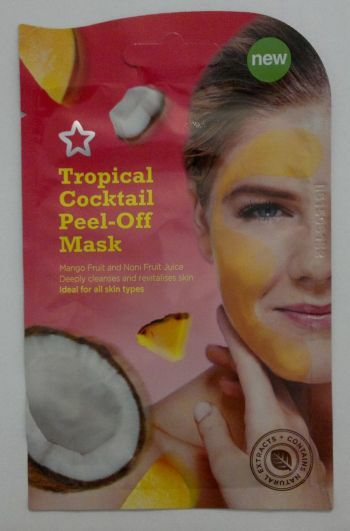 If you’d like to try Superdrug’s Tropical Cocktail Peel-Off Mask, it’s 99p only. In addition, Superdrug often runs 3 for 2 promotions on face masks. Hi there! 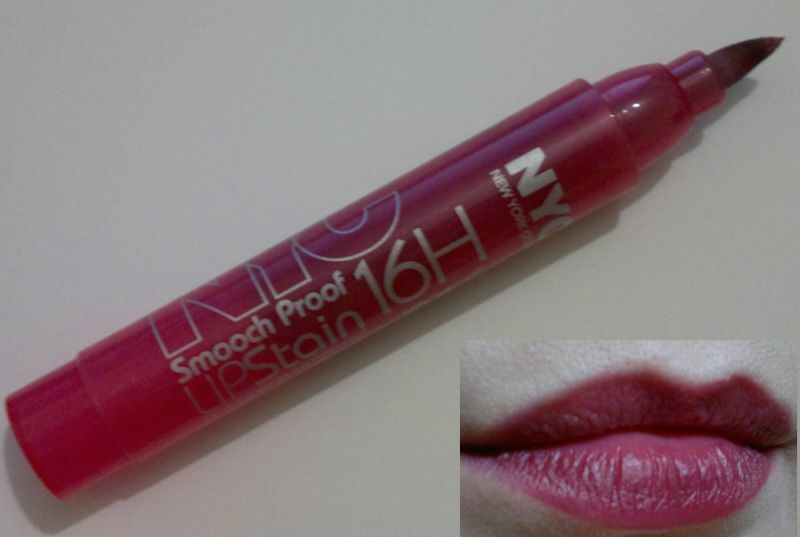 Today’s post is about my NYC 16H Lipstain in 493 Champagne Stain. I would describe the shade as a cool and soft fuchsia. And I love it. It’s pretty and wearable – I couldn’t ask for more. The product dries quickly once applied, and it really doesn’t wear off. Yes, the colour does somewhat fade, but I can get away with only one touch up during the way. Brilliant! The pointy tip is great for precise application and the subtle scent of apricots is very pleasant. The only thing that I would mention as a negative is that this product is a bit drying. I use lip balms all the time when I’m not wearing lipstick (or lipstain), but I don’t think that I could wear this lipstain for more than three days in a row if I weren’t such a lip balm nut. Hi there! I bought lots of Superdrug own brand products recently – with all those half price offers and triple points I couldn’t resist. 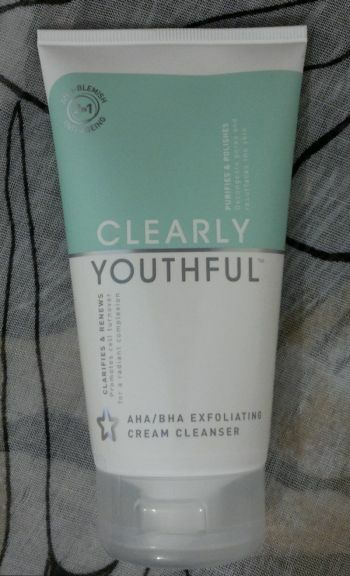 One of the products I’m currently using is Superdrug’s Clearly Youthful AHA / BHA Exfoliating Cream Cleanser which claims to target skin ageing and problem skin. Superdrug says… (and I’m almost quoting from the back of the tube) apply this cream cleanser to a cotton wool pad and (gently) wipe it across the face – avoiding the delicate eye area – until all (unspecified) residue has been removed. Superdrug also recommends that this cleanser be used alongside other products from the Clearly Youthful range. Unfortunately Superdrug doesn’t mention whether the cream cleanser is supposed to be left on the skin to work its magic overnight – or whether it’s OK (or even recommended) to wash it off or to use a toner. The thing is that there’s no toner in the Clearly Youthful range – otherwise it would have been a no-brainer! Anyway, now let me tell you about my experience with this cream cleanser. The first thing I noticed was the product’s smell. It’s strong, it’s unpleasant and it reminds me of a mix of stale beer and overly ripe fruit. Apparently this is what the sum of all the ingredients smells like. When I used this cleanser on my face, I felt a tingling sensation. I didn’t notice any redness or any other unpleasant reaction. But I knew that I really couldn’t let this product get anywhere near my eyes. And whilst this cream cleanser did a good job removing most of my make-up, I was a little annoyed that I had to use another product to remove my eye make-up. And I need to mention the smell again – wow, it really lingered! I’ve been using this cream cleanser several times now. And I tried different ways to make it work for me. But I’m not really happy with it. As I don’t want to be wasteful, I’ll continue to use it. However, I’ll limit the use of this cream cleanser to make-up free days (= when I don’t leave the house) like homeworking days and the odd Saturday or Sunday. And when I use this cleanser, I use it as a mask in the morning – this way I get to wash it off in the shower half an hour later. Since I’m using this cream cleanser a few times per week only, I can’t comment on whether it really delivers on its ‘anti-ageing’ and ‘clear skin’ promises. I have to admit that my skin looks a lot better (brighter, clearer, more even) than it did four weeks ago, and I’ve only had two tiny spots in these four weeks. But I don’t think my on/off use of this cream cleanser is anything more than a minor contributing factor. 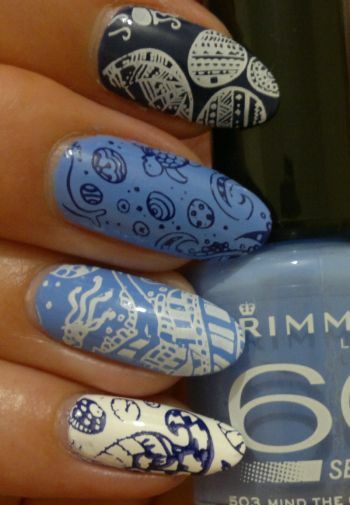 I think Superdrug’s Naturally Radiant products deserve the credit! I know I won’t be repurchasing this cream cleanser. But I acknowledge that it seems to work well for some people – all the reviews on Superdrug’s web site are very favourable. So if you’d like to try Superdrug’s Clearly Youthful AHA / BHA Exfoliating Cream Cleanser, you can pick up a 150ml tube for £3.69. I paid £1.79 only (half price offer), so keep your eyes peeled for promotions to get the best deal.